Lock in a great price for Minos Beach Art Hotel – rated 9.2 by recent guests! We rented a sea view bungalow #28 and it was amazing! It was the perfect location on the grounds and speaking of the grounds and the location of the resort, they could not be better! The entire compound was sprawling and very well maintained. The bed was very comfortable and the air conditioning worked well even in the middle of August. I would highly recommend the Minos! Property was beautiful. The lovely places to sit beside the sea, the sculptures, the pool and view from the room was stunning. Everything was close together - rooms, beach, pool, dining areas so it was very relaxing, peaceful and beautiful. Staff is attentive and helpful. If you are looking for a relaxing vacation in a beautiful place, this is it. No noise, no crowds, stunning sea and views. Fabulous hotel with beautiful grounds, and greenery all around, surrounded by the clear sea. Our bungalow was very comfortable, close enough to the small, sheltered beach that we could see our children paddle from the room. The buffet meals were excellent and generous, on a beautiful terrace with view over the sea. 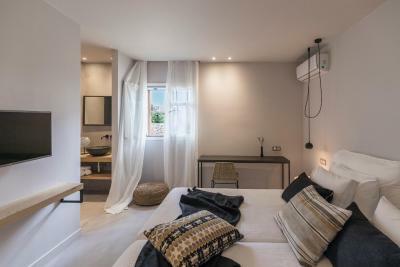 The staff were extremely friendly and helpful, and the hotel well located for easy access to walk into Agios Nikolaos, and to drive to sights on the east of the island. The hotel went over and above to mark an important birthday in our family (reason for the trip) - the room was upgraded and they also sent us a delicious birthday cake ! even the "simple"main restaurant serves exquisit menus. a few days per week this is a buffetrestaurant with live cooking.we had a villa with private pool, a great view and lots of space. 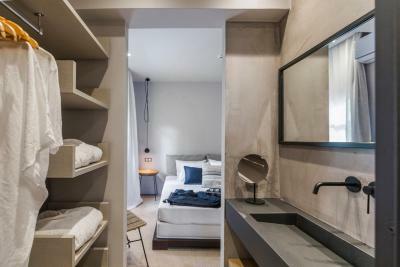 The hotel is a perfect mix of having your own mini villa within a hotel. The gardens and art works are fabulous and immaculate. All the staff are incredibly helpful, attentive but unobtrusive. The quality of food we had in the restaurants was excellent in particular lunch at Terpis. The atmosphere is very relaxed and the hotel never feels crowded. Friendly , smiling and conscientious staff . Excellent grounds and facilities . Excellent standard of food and beverages . Comfortable walking distance to town. 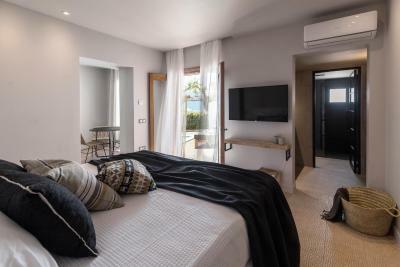 Minos Beach Art Hotel This rating is a reflection of how the property compares to the industry standard when it comes to price, facilities and services available. It's based on a self-evaluation by the property. Use this rating to help choose your stay! 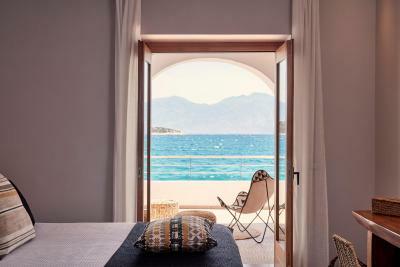 One of our top picks in Agios Nikolaos.Featuring a stunning location next to the water’s edge, Minos Beach Art Hotel features an art gallery and an excellent health and beauty center, along with complimentary breakfast and parking. 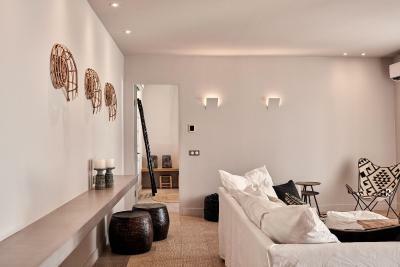 Just half a mile from the center of Agios Nikolaos, Minos Beach Art Hotel offers a variety of accommodations, ranging from suites to exclusive villas. 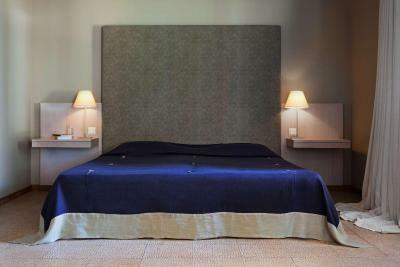 Each one is well-furnished with home comforts, including LCD TV and some feature spa bathtubs. Relax within the beautiful setting of Minos Beach Hotel’s gardens and pools. Admire the stunning views of the sea and the bay. Swim around the picturesque coastline surrounding the resort and join in with the water sports activities, including canoeing and diving. Enjoy some pampering treatments at Minos Beach Art’s health and spa center. 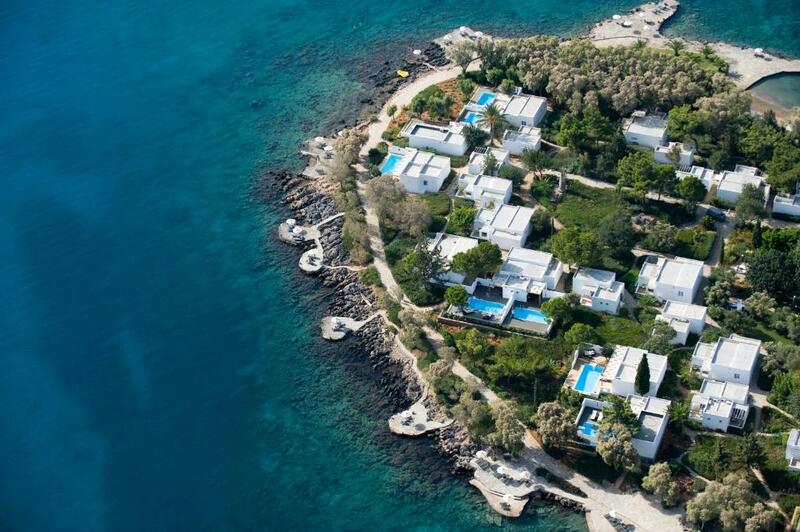 Minos Beach Art Symposium displays the works of contemporary Greek and international artists. Admire the stunning works of art that adorn the hotel’s grounds. After working up an appetite, savor the delicious haute cuisine and seafood delicacies available at the waterfront restaurant. This is the perfect place to relax and enjoy the peaceful and picturesque surrounds. A regular bus service from Minos Beach Art’s entrance takes you directly to Elounda Village and Agios Nikolaos. 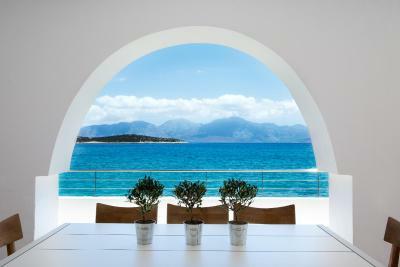 When would you like to stay at Minos Beach Art Hotel? 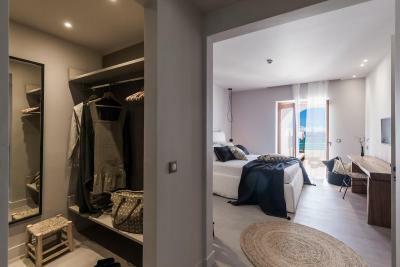 The Superior Bungalow offers approximately 131 ft² of space and consists of of an open-plan bedroom and living room and a luxurious bathroom with a shower cabin with hydromassage jets. It opens to a spacious balcony with sea views. Along with the listed facilities, it also features a CD player and a fax machine is available upon request. 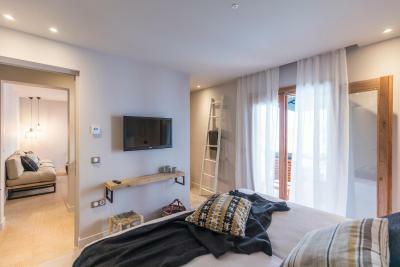 Located directly beside the water’s edge, these Superior Bungalows are 131 ft² and consist of of a bedroom and open-plan living area and a luxurious bathroom with spa bath. Along with the listed facilities, it also offers a CD player, VCR player and a fax machine. 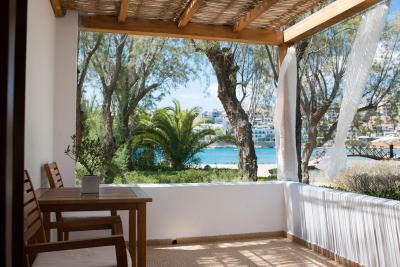 The large veranda offers a panoramic sea view and guests can also enjoy a reserved sun umbrella and sun beds. The Villa offers approximately 590 ft² and panoramic sea views. 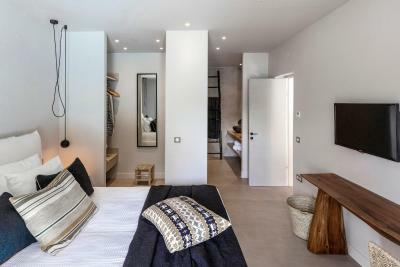 It includes a bedroom, sitting area and dressing area and a luxurious bathroom with spa bathtub. Other features include LCD TV and DVD home theater, along with Wi-Fi internet access and a fax machine. 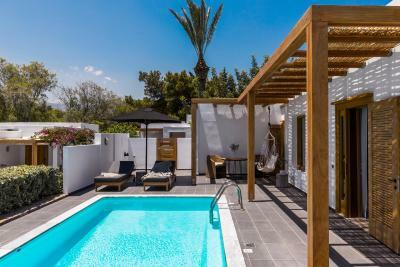 The Villa’s private swimming pool is surrounded by a large terrace. The Superior Bungalow is approximately 430 ft² and includes a bedroom and open-plan living area and a luxurious bathroom with spa bathtub. Along with the listed facilities, it also features LCD TV with a DVD player, CD player and a personal fax. 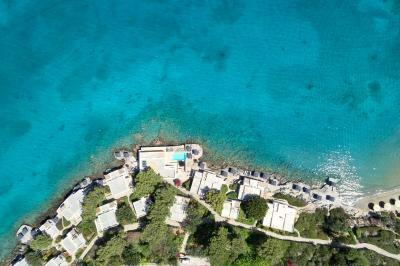 The private swimming pool is surrounded by a large terrace offering a sea view. 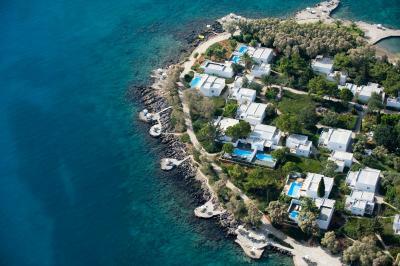 The Executive Villa offers a space of approximately 805 ft² and features a panoramic sea view. 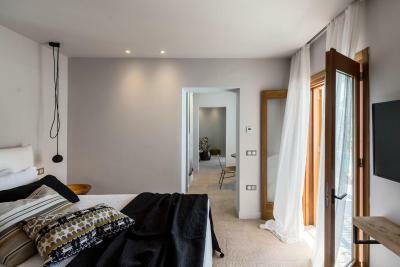 It consists of 2 bedrooms, one with a dressing area and luxury bathroom with spa bathtub. The other bedroom offers twin beds. A separate bathroom provides a shower cabin. 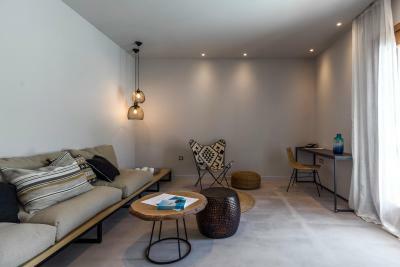 The spacious living room offers a sitting and dining area. Special features included LCD TV with DVD player and a fax machine and Wi-Fi internet connection. The Executive Villa’s private swimming pool is surrounded by a large terrace. 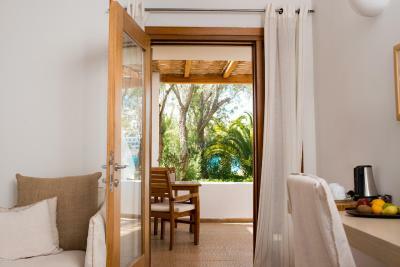 Elegantly furnished, this room opens to a spacious balcony with sea view. It has a seating area and a bathroom with a bathtub. This villa features a balcony, mini-bar and air conditioning. This bungalow has a balcony, flat-screen TV and mini-bar. 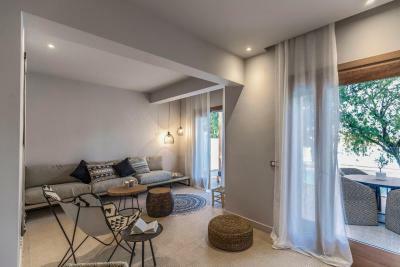 House Rules Minos Beach Art Hotel takes special requests – add in the next step! Minos Beach Art Hotel accepts these cards and reserves the right to temporarily hold an amount prior to arrival. Please inform Minos Beach Art Hotel of your expected arrival time in advance. You can use the Special Requests box when booking, or contact the property directly using the contact details in your confirmation. The size of the rooms. Not much space around the bed. Also the glass door in the bathroom provided no privacy. We loved the property, the facilities and the staff. The grounds were immaculate, the room was well equipped and spotless. Staff were very friendly. It was all amazing, it made the holiday truly special. Breakfast was especially good and the hotel gym was the best I’ve been to, even better when you can swim back to your bungalow as a warm down AMAZING!!! Wifi was very poor, not 5 star hotel standard. We only ate dinner at the hotel once, not a good experience, the hot food was cold, tough meat and limited selection. Wine by the glass was expensive. Much better food at the local tavernas for half the price. Breakfast seemed better with a good assortment on offer. Cleaning staff were constantly coming in to the room while we we showering or once still in bed! A do not disturb sign would be useful. No lift in the hotel making it difficult for the elderly. 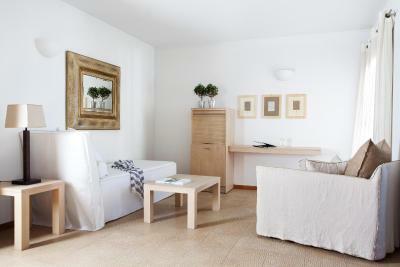 Lovely spacious room in this well designed complex. The balcony was large and private with a view to the sea.Beautiful gardens leading down to bungalows and many terraced swimming areas. Good quality sun lounges available around the pool or by the sea. Super comfortable bed. An easy 20 minute walk into the main town area. The staff are very courteous. The facilities in the hotel where new and Satisfying. Considering this is a five star hotel, food choices could’ve been better. The bungalow was very neat and clean albeit a bit small, especially the shower. They provided a coffee maker in the room but no iron or ironing board. We had a bad experience at the Massage/Spa. My partner was injured for a massage made by the receptionist girl. We believe they had no massagist available and in order to get our money, the receptionist girl made the massage. This facility is not from the Hotel it is an independent service. This Hotel is just amazing. We had a really nice bungalow just near the beach (num. 23) and we could enjoy all the facilities of the hotel, with amazing restaurants and places to have a swim. The room was sub-standard for a 5 star hotel. It was smaller than expected being a luxury hotel. The bathroom was also a bathroom you can find in a 2 star hotel, very small and outdated. We were looking for a 5 Star room to spend our honeymoon and it definitely didn’t meet our expectations. Furthermore, we mentioned that we were going to stay at the resort for our honeymoon and they didn’t provide anything special for our occasion.